President Felipe Calderón today warned of the interference by the narco underworld into the elections of officials, especially those at the municipal level, for the purpose of territorial control. “Today we must reflect on the threats that can undermine democracy so as to take precautions against them and block them. And among these threats are, without doubt, the depth and reach of the corruptive power and the intimidation by organized crime that can and has tried, in many nations, to influence the decisions of political action,” he asserted. The president also recognized that illegal financing occurs outside regular channels and suggested bringing the local process up to national standards by making political financing transparent. 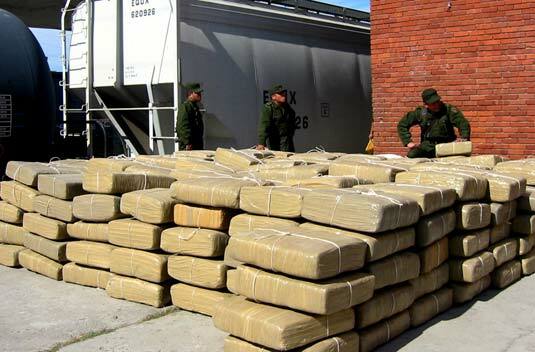 Calderón expressed his concern that the new strategy of organized crime is not only to transport drugs to the US, but also to manage the retail sales. This strategy requires them to control the authorities within their operating territories. Mexican and US authorities advised of the discovery of a tunnel in Tijuana, Baja California, of some 330 yards in length at a depth of some 30 yards with elaborate electrical and ventilation systems and even an elevator. Based on information from US Drug Enforcement (DEA), Mexican officials in Tijuana arrested a dozen individuals. The tunnel, under construction for about two years, had not reached into the US. The article also mentioned that the tunnel was in the Otay area. An armed group in two vehicles chased two youths in another vehicle through the streets of downtown Los Mochis, Sinaloa at midday, shooting at them at two different locations. The two youths [ages and names not provided] were first wounded by rifle fire, causing the driver to eventually lose control and crash into a telephone pole where their pursuers finished them off and fled. In the space of one afternoon today, six assassinations took place in Cd. Juarez in four separate events. All were targets of armed groups. “Like a scene from a movie, ” a car chase and the liberation of a presumed kidnap victim took place in Cancun, QR, at midday. When local police tried to stop a VW Jetta recklessly weaving through the streets, the occupants of the VW ignored the order to stop and the chase was on. Gun shots were exchanged and other units joined in, finally stopping the fleeing car and arresting two men while freeing their passenger who had allegedly been abducted.